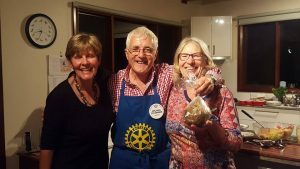 November 2016 – Narooma Rotary Club Inc.
What a week, so much went on that it seems a blur. 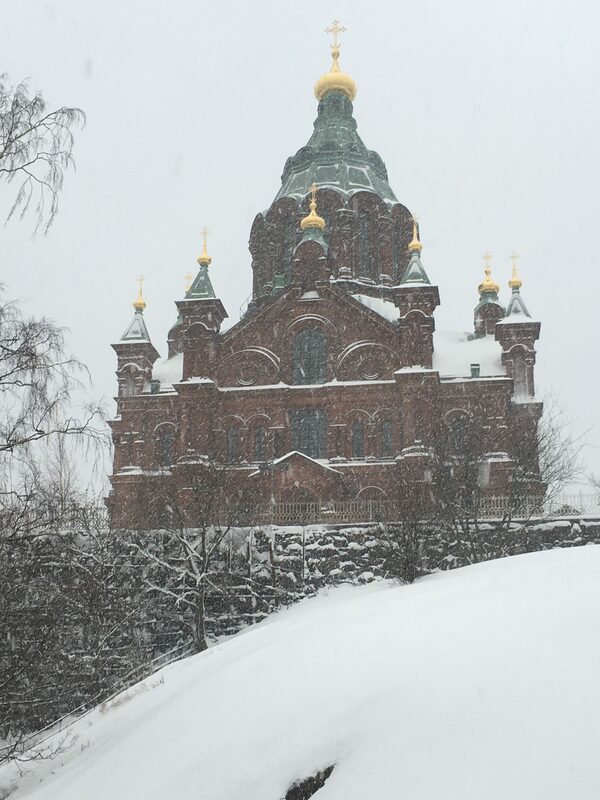 had no jacket, but it was great to meet the locals and visitors impressed with what we were doing. This was followed by an EXPO meeting to finalise the event planning. Thursday, saw us having our regular Rotary meeting at Donna’s and my home. By the response it seemed that the idea of eating a ‘Meals on Wheels’ meal was a great way to introduce the service. Carol Meindl gave us a wonderful rundown on the service and by the noise of the conversation it seemed everyone had a good time. Some even said it was a “fun” night. Friday had many of us setting up the leisure centre for the Expo. 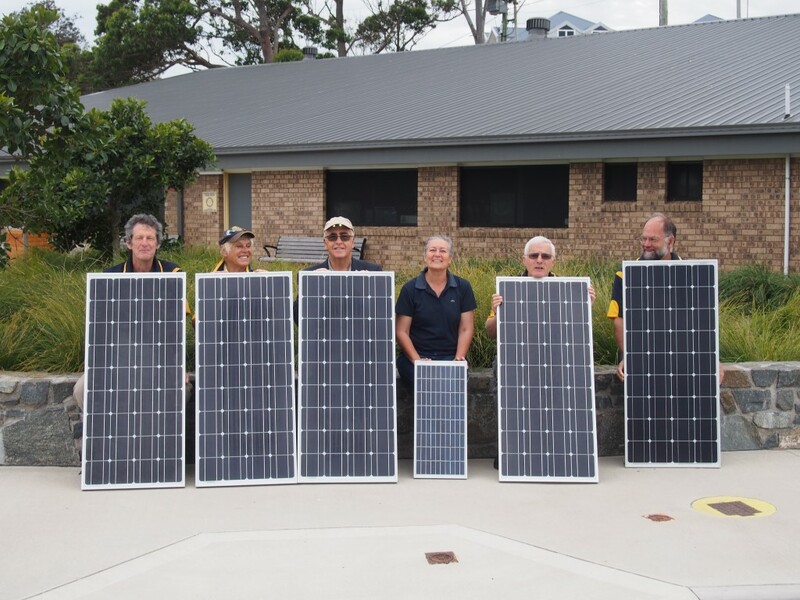 Narooma Rotary President Michael O’Connor, MC Narooma Rotarian David McInnes, Lisa Miller from the Office of Environment and Heritage, Solar Council CEO John Grimes, Expo Coordinator Frank Eden and Lawrence McIntosh from SolarShare Canberra. What an EXPO! The response from the community was to put it mildly, amazing. It shows that vision and passion of one of our members can lead to a great outcome. Once again thank you Frank for encouraging Rotary to take up the challenge. Not only did we get a great number of visitors, the exhibitors were delighted. The excellent speakers on Saturday night just added to the event. 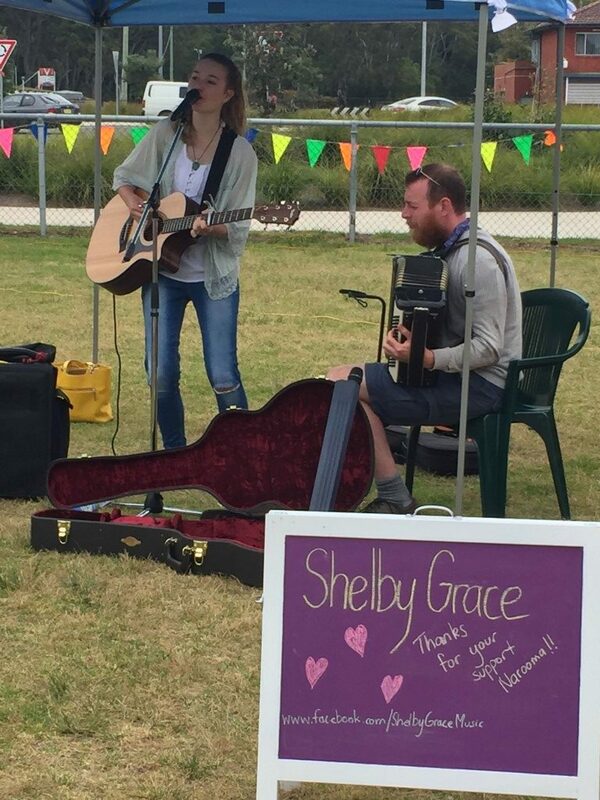 Shelby Grace jamming with Lawrence Macintosh at the markets. families in those countries. 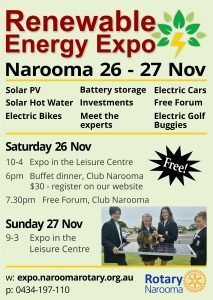 I think the quote of the EXPO was when I was explaining what Narooma Rotary were trying to achieve by selling the lights one customer said. “If you stop talking I will make a donation” I promptly got the donation. Finally, Sunday saw us working at the markets and at the EXPO. Unfortunately, I was unable to get to the EXPO as I was at the markets, but by all accounts it was just as good as Saturday. At the markets I think I may have embarrassed the Rotarians who came with me when I was hustling for donations to our 1000km walk. It worked – I got $425.50 in donations. To everyone who helped with the expo, a big thanks! Saturday saw a big crowd of over 400 people in the Leisure Centre which was just big enough for some 20 exhibitors, mostly local with some from Bega and Canberra. On Sunday there were fewer people but we still had over 200; we think that those with a keen interest to make savings on their power-bills had come the day before. At the time of writing, final figures are not in yet but I expect them to show that the event was very successful. Attendance was at the high end of expectations and in dollar terms vastly more than expected, which is not bad for a free event. We had two tables at the entrance to the Leisure Centre. At the first we asked for people’s postcode which allowed us to collect some attendance numbers (not everyone filled it in) and an idea of the demographic. A large number were from out of town, some obviously travelling (Adelaide, Wodonga and Melbourne), but many came from across south-east NSW and some from Canberra. 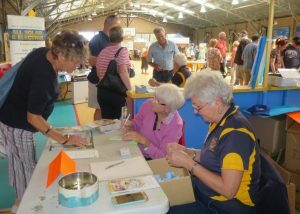 One Canberra couple had come down especially for the Expo. We gave people tickets for a lucky door prize. On the second table we promoted solar lights organised by Charmaine White. Loads of people donated $10 or $20. We quickly sold out of the stock we had pre-purchased. The highlight of the weekend for me was the information night. A great buffet dinner for $30 pp was provided by the club which definitely set a convivial mood. John Grimes, CEO of the Solar Council was first up with a very interesting account of past and present situation. Some $45 billion has been spent in recent years providing mostly unused grid capacity. He also provided a very clear explanation of net metering and smart meters. Our MC for the night, David McInnes introduced Lawrence McIntosh from SolarShare Canberra. Lawrence also does work for UTS in Sydney and was involved in some recent work looking at virtual net metering and mini grids. Our third speaker, Lisa Miller from the Office of Environment and Heritage, spoke about ‘Demystifying Solar’, with a ton of practical advice and a free USB stick with lots of information. I love Narooma. Local businesses were so generous in sponsoring this event. Thank you all! 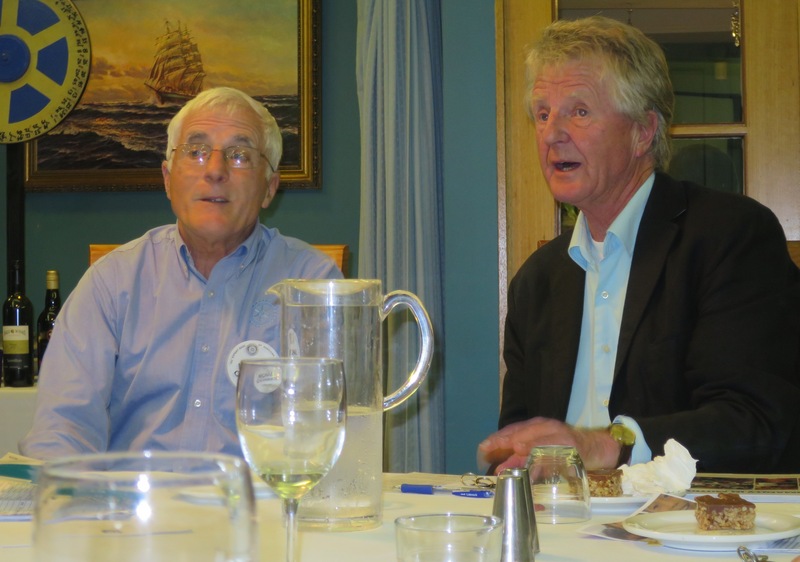 I think Michael and Frank have summarised the week very well – it was full on and a great one for Narooma Rotary. The Expo certainly put us front and centre in our community. 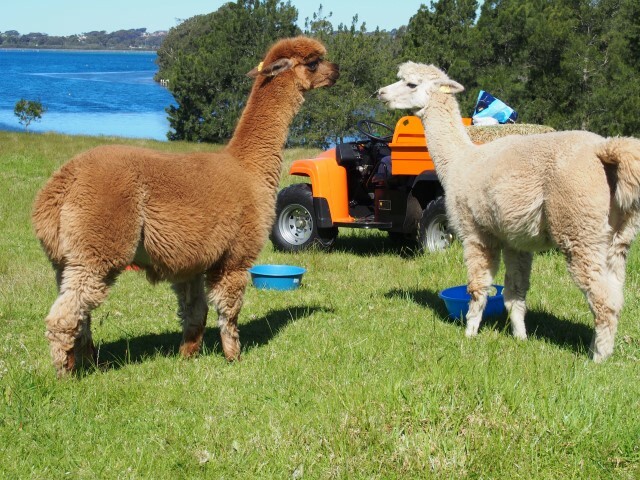 Check out our Facebook page to see a Narooma News video highlighting the event. Click here to access the page. Grandparents are a lady and a man who have no children of her own. So they like other people’s. Grandparents don’t have to do anything except be there when we come to see them. They are so old they shouldn’t play hard or run. It is good if they drive us to the store and have lots of quarters for us. They can take their teeth out. Grandparents don’t have to be smart. They answer questions like “why isn’t God married?” and “How come dogs chase cats? “. They know we should have snack-time before bedtime and they say prayers with us every time, and kiss us even when we’ve acted bad. Well it was a week of ticket selling and packing bags. Wednesday saw me outside the IGA on the Flat and on Saturday outside the Newsagency selling race tickets and promoting the Expo. On Wednesday I was helped by Bob Antill and by Charmaine on Saturday. We have sold over 90% of the race tickets allocated to the Club. On Thursday we toasted the Rotary Club of Blenheim South, the closest club to the earthquake that rocked NZ last week, and the hamlet of Kaikoura that seemed to be worst hit by the earthquake. Finally, on Saturday, at Charmaine’s house, eight of us packed bags for the Renewable Energy Expo. 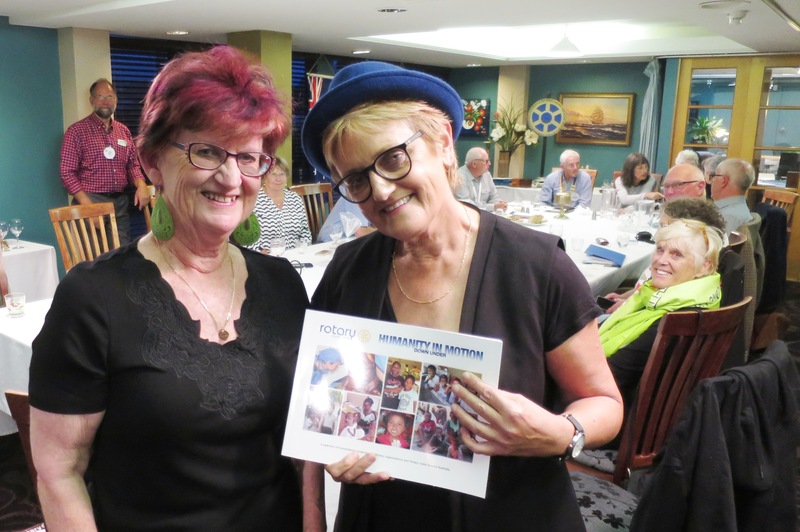 Many thanks to Charmaine, who once again showed her generosity in support of Rotary. Remember: this Thursday, we are feasting on the delights of Meals on Wheels and learning about the work the organisation does in our community. our guest speaker, Robin Scott-Charlton and regulars, Sandra and Merinda. Robin Scott-Charlton, inspired us with her tales of a recent trip to the USA where she participated in a choir that performed in many churches, predominantly African American, in areas as diverse as Chicago, New Orleans and Memphis. In between performances Robin was able to tour the sites, including Graceland – the home of Elvis. After her presentation Robin was joined by Merinda, Angie, Chris and Sandra for a bit of soul signing. See the clip below. An effective Club needs a strong and active Board to operate productively. If you are interested in keeping up the good work of Rotary in Narooma please nominate for a position. Please let Michael know of your interest. This week is a big one for the Club with the Assembly and special ‘Meals on Wheels’ dinner on Thursday and the Narooma Rotary Renewables Expo on Saturday and Sunday. The Committee has done a wonderful job organising the Expo. Let’s hope that the weather is bright and sunny and that crowds flock to the exhibits. An elderly gent was invited to his old friends’ home for dinner one evening. He was impressed by the way his buddy preceded every request to his wife with endearing terms-Honey, My Love, Darling, Sweetheart, Pumpkin, etc. The Rotary week began with Donna and I attending the Lions Youth of the Year at the Narooma Golf Club. It was a great night and well adjudicated with our very own Charmaine White The chief adjudicator. Alicia Bate, a fellowr firie with John at Dalmeny was the winner. I have been told that Narooma Lions will be holding the Statewide Lions Youth of the Year in March 2017. I will be on the Bibbulmun Track by then but it would be great if we could fill a table at the event. On Thursday we had a interesting meeting and talk on the Christine Noble Foundation by Terry Cassels. Interesting for me was that she was living on the streets of Dublin around the same time that I was handing out soup to the homeless all around the city on a Saturday night. I informed Allan Spencer, head honcho of the National Busking Championship that we agreed to host the Championship on the 27 May 2017. He was delighted with our response. After the wonderful Wooden Boats afloat event I went to the Lions markets to say hello. They were packing up when I arrived but by all accounts they had a successful market. Finally, remember the dinner meeting on the 24th November is at our place 153 Old Highway. 6.00pm for 6.30pm Latecomers and their friends will be accepted but they will miss out on the meals on wheels cuisine but there will be other food and drinks. 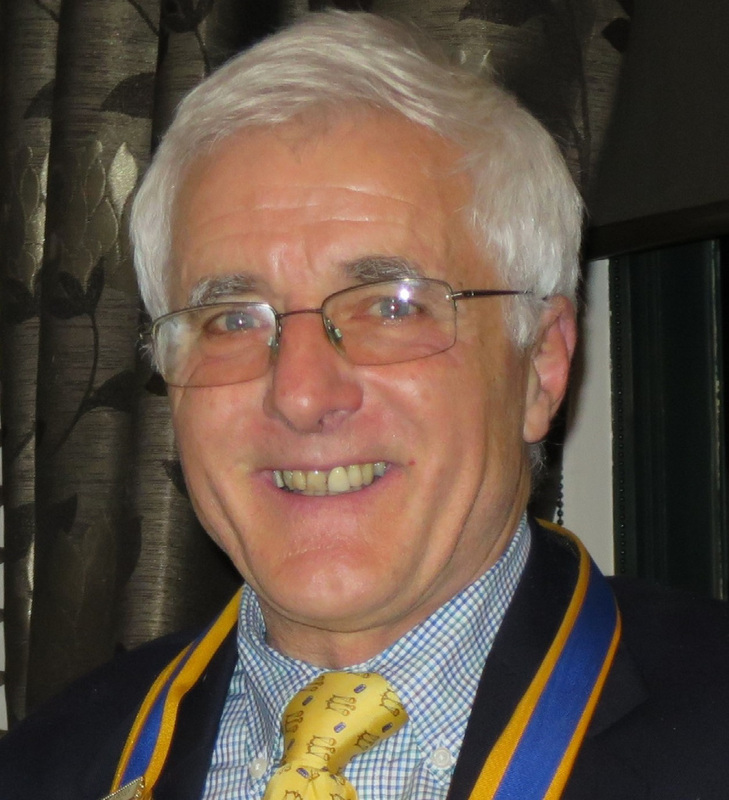 Next week’s meeting will be a Club Asembly at President Michael’s place. Michael has already emailed members the agenda items. The fare will be from Meals on Wheels – should be fun. Yes folks the Editor is back – well almost. I am currently finalising this edition of the Beacon in our hotel room in Hong Kong, iPads and the Internet make the impossible possible. Therese and I will be back home on Tuesday. Thank you to Peter Bull and Frank for keeping the Beacon rolling whilst I was away. I enjoyed keeping up with Club events through the weekly newsletter. 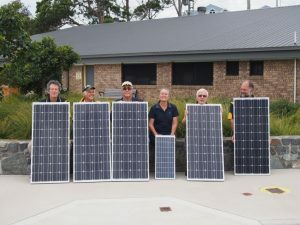 It seems that the Club has a busy time ahead with the Renewable Expo at the end of the month as well as planning for the National Busking Competition next May. Therese and I have had the trip of a lifetime. The three months away have gone in a blink of an eye. 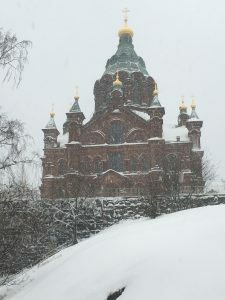 We have experienced the full range of temperatures from more than 40 degrees in Dallas to minus 7 or 8 in Helsinki as well as some varied and interesting cultures. There were many, many highlights for us along the way; two however, stand out. One being able to spend some time with our daughter, Clare, for a couple of days in England and for over a week in the Italian city of Bergamo where she is studying for the year. She delighted in showing us how she was mastering Italian language and culture. The second was spending a week in Northern Ireland with Jonathan Coulter and his family. Jonathan was a Rotary EXchange student who stayed with us for a time in 1997 when Therese and I lived in Nyngan. Jonathan still believes that the year that he spent in Australia was one of the best and the exchange program helped him greatly to set his future goals. Jonathan has a doctorate (as does his wife) and now plays a significant role in prostrate cancer treatment research at Queens University, Belfast. Another example of the value of Rotary in our society. I thought things would settle down after the weekend in Goulburn at the District Conference, alas it was not to be. On Monday I attended a great Probus meeting at Club Narooma. The club welcomed me and were happy to hear about our 1,000km walk. I think by the end they believed me, that 1,000km would be walked. I outlined the END POLIO campaign and the Library project at Rang’I in Kenya. Very generously they donated $85.00 and bought some jewellery from Rang’I. On Wednesday I and ADG Bob Antill went to Moruya for a meeting on our Race Day in December and then back to Narooma for a Rural Fire Training night. 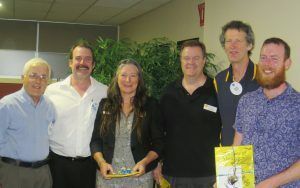 Thursday saw us having a full Assembly at Club Narooma where many issues were raised. Particularly important is for the Club to make a clear decision as to whether it is a Dinner meeting club or not. Emails will fly setting out the issues we need to deal with. Of particular importance is our AGM on 1st December where all positions for the club in 2017/2018 are up for grabs. On Friday Donna and I went to Cooma via Canberra. At Braidwood I bought new boots for the 1,000km walk and in Canberra I purchased and had fitted ( I did not realise this was going to happen) a 85 litre pack. Being lighter by hundreds and hundreds of dollars we then moved on to Cooma. 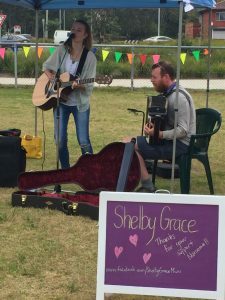 Saturday saw me at 6.30am at the Park helping to set up the National Busking Championships. Met John and Sandra and we kept meeting around Cooma selling busker dollars. Chris and Ange were also there, but I did not see them during the day. I did see Chris at the Cooma hotel later that evening. I did not come away empty handed, as I won a guitar and collected some towels from a raffle I had bought tickets in at Bega the other week. Got home on Sunday exhausted and ready for another week of ROTARY. The constitution and by-laws documents are now to be found on our website, on the members-only page. The logo has been added to the constitution, some formatting changes have been done, and spelling errors corrected (thanks Mike and Michael). From now on, these documents are “gospel” and will only be changed at the request of the Club secretary. Preparations for the Expo are progressing well. Many thanks to the expo committee who have done a sterling job helping to organise this event, thanks to Niels Bendixsen, from Three Squared for our logo artwork, and to Rachel who did our poster and the big banner that will go up soon. And a big thank-you also to all of our sponsors, we have had so much support from our local businesses! Keep on eye on facebook – we have commissioned a video by Tim from Pelican Digital, who has taken some fantastic footage from his drone. It will be out real soon. And I hope by now you have shared the “Dave The Solar Cat” video – if not please follow the link and or send me a friend request. I cannot overstate the importance of facebook to our promotion of this event – we do not have the funds to do promotion in more conventional ways. If you do not have a facebook account, just send emails to your friends !